Root intrusion is probably the most destructive, and yet common, problem a property owner confronts when maintaining a residential or commercial sewer line. Property owners are often surprised to find out that roots not only cause problems in areas with trees and bushes, but they will also will travel to penetrate lines in other areas, including under slabs. What Causes Tree Roots in a Sewer Line? Sometimes there can be a tiny hole or crack, or separation in a drainage line. When warm water leaks from these cracks the roots from surrounding trees and vegetation are automatically attracted to it. The warm flow of water in a drainage pipe will create condensation on the exterior of the buried pipe. The mixture of condensate moisture and the humid vapor off of the exterior of the warm drainage pipe provides a great environment for all types of roots. Tree roots travel amazing distances in their search for moisture. When they locate a concentrated source of moisture like a drainage pipe leak, the growth activity intensifies in that spot. 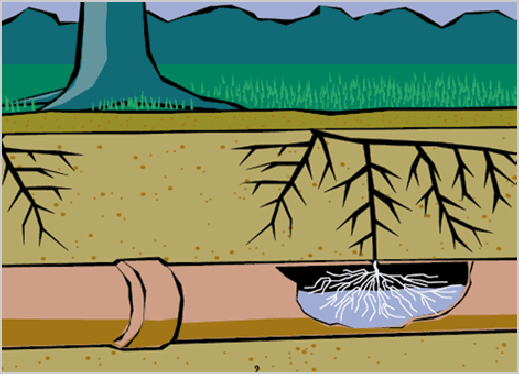 The smallest hole, crack, or separation will allow roots the size of a hair to look for the water, and tiny roots will enter the pipe and literally grow inside the pipe, and as they grow they expand the hole or opening to allow larger, multiple roots to intrude. Before you know it, your sewer line is ruined. Advanced Trenchless Inc. can make the solution easy and affordable. As our website says, “With the latest in technology there is no longer any need to open a trench across your entire yard. An entry hole and a exit hole are all that is needed. Trenchless technology leaves your property and most of the landscaping in tact, avoiding most sprinklers and lighting systems.” If you are in the counties of Marin, Contra Costa, Alameda, Solano or Napa, call us at (707) 644-7700, (510) 352-2220 or (925) 932-4023 to schedule your FREE estimate. How do you Know Your Sewer Lateral Line is Damaged? © 2018 Advanced Trenchless. All rights reserved.